I never played this back in the day, or even looked at the books, but I always thought it sounded kinda cool. I think it sounds even cooler now, so I had a look on ebay. Luck was on my side, and I now have a very cheap copy of the books winging their way to me (albeit without the box -- which I'm not particularly bothered about). After the fun I had with last year's April A to Z, and the nice collection of spells which resulted from it, I've been thinking recently about 1: if I'll do it again this year, and 2: if so, what will be the theme? Early on I ruled out doing another A to Z of spells, and had the idea that I wanted to use the alphabetic inspiration to put a bit more flesh into my Labyrinth Lord campaign somehow. A gazetteer of some kind? Descriptions of some inns and taverns in S'raka, the great city where the adventurers are based? Yesterday an interesting idea came to me. I've had this concept that clerical spells aren't easy to come by. That you can't just walk into any old temple and request a raise dead or remove curse or whatever. The idea is that each spell can only be provided (and then usually as a long-winded ritual) by a temple or shrine whose patron is in some way connected to the effects of the spell. The only practical example of this in the campaign so far was when the PCs got one of their number extracted from his incarceration inside a magical book by visiting the temple of Hgriselde, lady of pacts and bindings, and getting a dispel magic cast. So, I thought about maybe making an alphabetical list of all clerical spells, and for each one making up a few details about one or more temples in S'raka where the spell might be available. I reckon this would result in a very nice campaign resource, which would bleed over into adding a lot of detail to the various city districts, and to greatly fleshing out the multitudinous cosmic powers which are worshipped in the place. Just reading Daddy Rolled a 1's post about AD&D 2nd edition, where he mentions how one thing he really liked about that edition was the "kits". I played a lot of AD&D 2e, but never used kits at all. But it got me thinking about them again, and I looked a few up. My feeling about them now is that while mechanically I don't like them (they depend on the proficiencies system, and seem to add a lot of complicated abilities and mechanical bonuses to things, which I find too fiddly), I do like the flavour of them. I've often thought it'd be nice to give players a list of inspirational ideas for character concepts per class, especially in an old-school game where there are only a very limited number of classes, with no "options" at all. So here are the kits for fighters, thieves, clerics and magic-users (the latter two aren't particularly imaginative to be honest). There's actually a complete list of them all in wikipedia, for further reference! Here's a little summary of the main sentient races that have featured in my LL campaign so far, mainly for the benefit of the players. The natives of Old Aalia are olive-skinned, like the people of the Mediterranean. Pale, blond-haired northerners, and dark-skinned southerners are also seen from time to time. The strange radiations which permeate the vaults of the great city S'raka have caused the accelerated and haphazard evolution of those down-trodden people who inhabit the region. Mutations, ranging from the completely debilitating to the potently novel, are rife among this folk. Rat-folk, sometimes called "halflings", are another race which has evolved in the warping influence of S'raka's vaults. They are half the size of humans, and appear to be a 50/50 cross-breed between humanoid and rat. Most rat-folk spend their lives in the vaults of S'raka, where they live as scavengers. A few of the more gifted members of this race sometimes venture to the surface, and may find a way to make a living as adventurers or business-owners. They are generally regarded as vermin, in the same social class as beggars or mongrel-men. The dwarrow are a race similar to the standard D&D duergar. They live underground in labyrinthine cavern complexes which they constantly expand and mine for minerals. Dwarrow have jet black eyes, and skin that is gnarled like old tree roots and coloured in hues of earth or stone. Although they are important trade partners, the dwarrow are seldom trusted by humans -- they are exceptionally avaricious and scheming, regarding all forms of precious metal and gems as the sole property of their race. Dwarrow are known for their contempt towards other races, and are fond of slavery. Kobolds are commonly kept as mining slaves by Dwarrow -- the fortress city of Minitol, in particular, maintains a very large population of the creatures. The Dwarrow of the Glaarm mountains in the far north of Old Aalia harbour a hatred and resentment of the race of Kobolds, with whom they have been at war since a slaves' revolt succeeded. Sworn enemies of human-kind, the swine-folk of Old Aalia are a detested race of carnivorous beast-men created centuries ago by a demented god. Wherever the swine-folk go they leave destruction in their wake. A diminutive race of snivelling wiry-haired dog-men, kobolds are equally at home underground and on the surface. They dwell primarily in the forests in the east of Old Aalia, though some kobold settlements are known to exist in the deeper vaults of S'raka. They are also often found in the company of dwarrow, who keep them as slaves. When left to their own devices, kobolds tend to roam around in large packs, and generally show little respect for other races, though among themselves they have a rigidly structured social hierarchy. A meek and homely race who live in burrows and caves among the roots of forest trees. They are friends with burrowing animals such as moles and badgers, and primarily enjoy the pleasures of a quiet life in a cosy home. Subterranean relatives of the forest gnomes, svirfneblin are a pale and almost hairless race who make their homes deep underground wherever gem deposits can be found. The race is so rarely seen (except by dwarrow, who encounter their communities in the course of their own delving) that rumours abound about their nature and their existence. A common conception among humans is that the svirfneblin cosmically manifest around mineral deposits. Tall, thin and ephemeral, elves are a fey race native to a magical dimension which exists in parallel to the world of men. They are of diverse appearance, being basically similar looking to humans, but always have one or more unusual features that mark them as obviously non-human, such as: pointed ears, silver or violet hair, cat-like eyes, sharp pointed teeth, extra fingers, etc. Often Neutral in alignment, elves are fickle, mysterious and mischievous. They enjoy music and song, as well as fine food and drink -- but all their pleasures have a strange otherworldly quality, which other races can find both intoxicating and eerie. They have a talent for magic, and many individuals have some degree of innate magical potency. Although they seldom co-habit, elves and goblins have a mutual respect for each other. Their kings perhaps have some kind of alliance. A mischievous fey race, goblins are of diverse appearance. Typically they are half human size, hideously or comically ugly (by human standards), and have black or dark green skin. Though they seldom have any regular or organised contact with other races (apart from elves), they have a habit of appearing out of nowhere, causing trouble, and then returning to their own dimension via whatever subtle path they arrived by. I just finished compiling my Carcosa / Mutant Future character generation rules into a PDF. Note that these rules assume the use of the Mutants & Mazes section at the end of the MF rulebook. So we're talking D&D style characters (with 1HD at 1st level, not CON HD), possibly with mutations from MF. Also note that in the end I decided to make the ability to learn and perform sorcerous rituals a special skill -- that is, not available to all characters. It kind of seemed to make more sense that way. So now I've got all the chargen rules for my Carcosa game sorted, I've started having a bit of a think about an initial adventure, and whereabouts on the large campaign map it'd be set. The obvious place (I thought) is in the vicinity of hex 2005, as that has already been described in greater detail in the Fungoid Gardens of the Bone Sorcerer adventure. 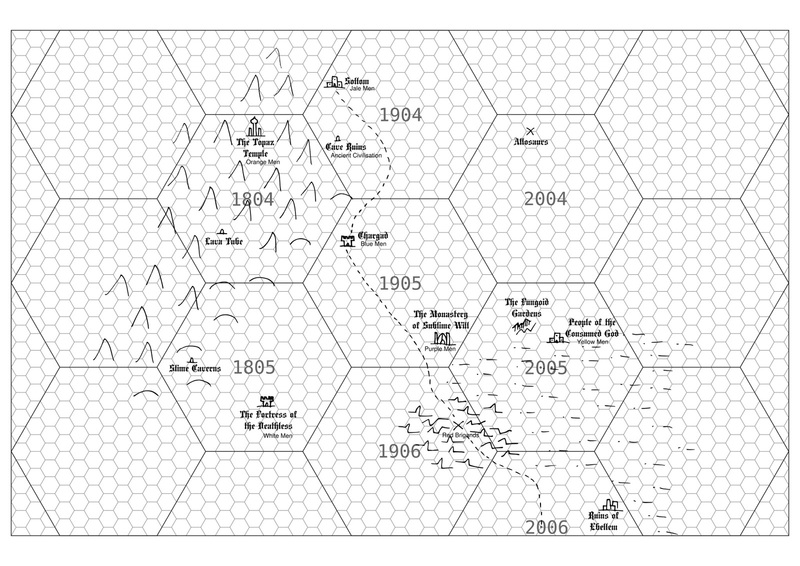 So I chose hex 1905, one hex to the north-west of 2005, as the starting point. 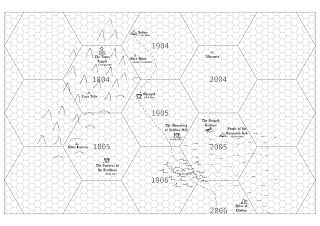 To get things going, and to kind of orient myself in the setting I've created a basic map of hex 1905 and the six surrounding hexes. For now it just shows the points of interest which are described in the Carcosa book, with some names I've made up and a road drawn in between a few of the settlements. Seems like a good start... I'll add more details as I go. As I first read the Labyrinth Lord rule books, and began to conceive the campaign I'd like to run, one of the first decisions I made was to ditch hobbits and to reskin the halfling class / race as rat people. This simple change has worked out marvellously, and has really helped to add a bit of unique flavour to the setting. I've been thinking recently about the word "halfling", and its possible use for a whole swathe of other half-sized folk, some of whom could quite possibly be adventurers. Similarly, I thought that the standard halfling class or race could easily be used for these other races, perhaps with a slight tweak to give each of them some unique ability. So, mechanically speaking, the halfling races have all the abilities granted by the standard LL halfling race or class, apart from the hiding ability, which is replaced by a unique racial ability as described below. I have also given them all infravision, as they usually dwell underground. Rat-folk: Humanoid rats, complete with fur, tails and twitchy noses. Actually do have the hiding ability (as per hobbits), which works 3 in 6 in any environment. Kobolds: A diminutive race of snivelling dog men. Tend to hang out in packs. Kobold adventurers have the ability to track with their excellent sense of smell. In my campaign, kobolds are a wretched and cowardly race, although intensely loyal to their companions. Although their respect for other races is minimal, among themselves they tend towards lawful alignment. Their societies display the full range of good and evil, similar to any human culture. Goblins: In my campaign goblins are a fey race (the same as elves), meaning that they originate from a parallel dimension, where they typically spend most of their time. Some however may become adventurers and choose to explore the physical world. As a special ability they know additional languages (the tongues of fey elves and pixies), can identify dimensional portals, and are 90% immune to charm effects. In my campaign, while goblins are mischievous and tend towards chaotic alignment, unlike the standard D&D goblins they are in no way inherently evil. 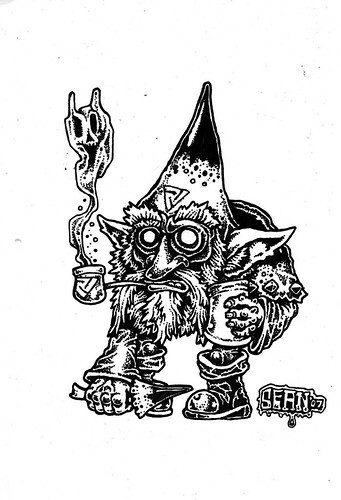 Deep gnomes (svirfneblin): Yet to be specifically encountered in our games, but having been referred to, this race dwells in deep subterranean caverns, and are sometimes encountered by the dwarrow as they delve for metals. They have the ability to know their depth and orientation underground, and to detect sloping passages. These abilities work 2 in 6 of the time. They also speak the tongue of the dwarrow. 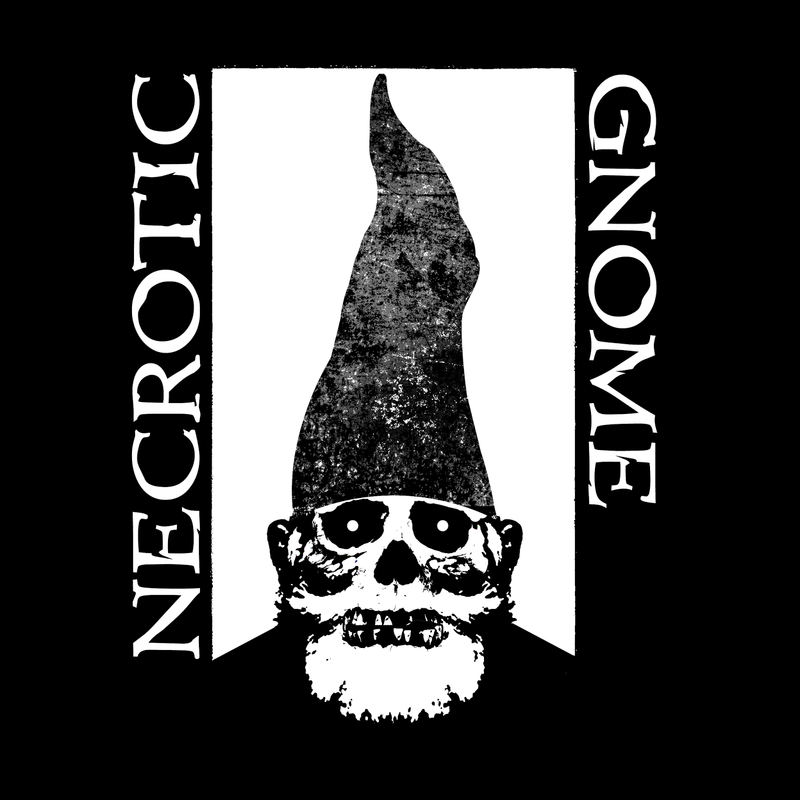 Forest gnomes: A meek and homely race, unlikely to produce much in the way of bold adventurers. Nevertheless, if such an individual were to exist they would have the ability to speak the languages of burrowing animals, and a 2 in 6 chance of detecting decrepit or unstable structures underground. Note that all of these races have the standard restrictions of the halfling race, as regards to minimum / maximum ability scores, and level limits. 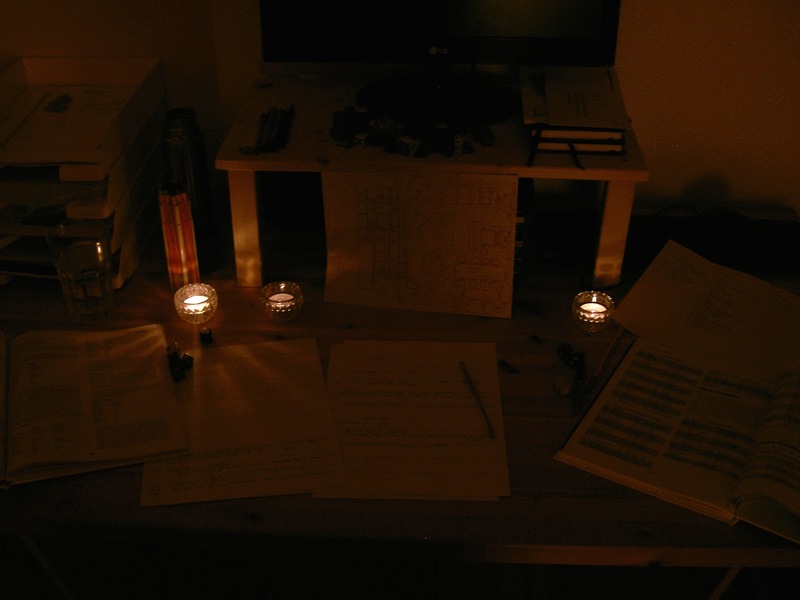 The last phase of my Carcosa / Mutant Future chargen rules, we come to the learning and use of rituals. As previously discussed, I've decided to reduce the number of available classes to 1, effectively removing the sorcerer class as presented in Carcosa. However, this doesn't mean that rituals are an NPC only thing. On the contrary, any PC can learn and perform rituals (or at least try). The concept I'm going with here is that when adventurers "find a ritual", they've actually (in general) found a complete description of everything involved in performing it -- including any esoteric theorems or such like which might be needed as background. So taking a leaf from Call of Cthulhu, the main difficulty with rituals... well, the main difficulty in addition to the moral and logistic problems inherent in most Carcosan rituals, is the time required to study all that weird text and understand and learn it well enough to be able to perform it properly. I think I'll say 1 week per attempt to learn a ritual. As with other "skills", learning a ritual will have a 2 in 6 chance of success, modified by INT, and can be retried over and over, if a PC wants to. In addition to having a high INT, two other factors are relevant. Jale Men get a +1 bonus, as do those with the arcane lore talent. Other than that, all the rituals in the Carcosa book will operate exactly as described therein. Now, the second point of interest is that I want to also allow all the rituals from Call of Cthulhu to be (potentially) accessible to PCs as well! This was an idea that struck me as I was reading Carcosa -- how I also have this other book on my shelf (CoC 30th anniversary edition) which has loads of cool creepy rituals which would fit right in with Carcosa. They're a lot lighter on the human sacrifice, but their effects are generally less far-reaching as well. I thought that the two types of ritual would nicely complement each other. The only trouble is that D&D (or Mutant Future, in this case) is a different beast than Call of Cthulhu, mechanically speaking. Conversion time! When a ritual specifies a loss of magic points, this translates to a loss of hit points. A nice simple system, which fits well with the D&D trope of PCs gaining more hps (and thus being able to use more magic) as they go up in level. I also like the idea that by using some types of magic you are actually risking your own life. Rituals which specify a loss of sanity result in an equivalent (but temporary) loss of WIS. WIS lost in this way would be recovered at a rate of 1 point per day or week or something. Rituals causing a loss of POW (which is permanent, as far as I gather) result in a permanent loss of WIS.
WIS, then, is being seen as representative of a character's sanity, which is a system I've heard mentioned here and there before. It has the nice side-effect, I think, that loss of WIS makes a character more susceptible to magical forces -- i.e. to having his or her mind blasted and taken over by otherworldly entities. Nice. Other than that, I think the CoC rituals should work pretty much as written in a D&D environment. So, that concludes my Carcosan chargen rules. Mix that lot in with Jeff's "what went wrong" doc and I think we have a nice old-school system mash-up on our hands! I'll probably put all this together into a PDF at some point, for use in my planned Carcosa session(s), and for the reference of anyone else who decides to go down a similar route! ps. That was my 200th post on this blog! Crikey, that went quickly! So, next up in my Carcosa / Mutants & Mazes chargen rules is choosing a class. In Carcosa it is suggested that there are only two classes of adventurer: fighters and sorcerers. I have decided to reduce this even further and have only one class, making the whole concept of classes redundant. Thus there are no classes. What differentiates characters (apart from their randomly determined race and any background / personality traits which the player might imagine) is a choice of talents. Before going into what the talents do, here are four standard skill rolls which players can make. You will notice these are based on the standard "adventuring actions" of D&D. All skill rolls have a base 2 in 6 chance of success, modified by specified attribute (minimum 1 in 6 chance, maximum 5 in 6). Move quietly (DEX) - penalised by 1 per point of AC below 8. Climb (DEX) - 30' per roll, penalised by 1 per point of AC below 8. Smash stuff (STR) - usually makes a lot of noise. Ok, pretty simple, and you can see how characters with high DEX, for example, could choose to wear light armour in order to take on a thief type role. So, the talents. Each player can choose 3 of the following for his PC. As currently conceived, these are a one-off choice -- it's not possible to learn new talents as a PC advances. Again, many of them are based on a 2 in 6 chance of success, possibly modified by an attribute. Lockpicking (DEX) - one turn per attempt. Pick pockets (DEX) - target notices on a roll of 6. Tracking - make a search roll to find & follow tracks. Languages - know additional languages per INT score. Climb sheer surfaces (DEX) - automatically succeed at climbing, roll to climb sheer surfaces. First aid - spend one turn up to 1 hour after a battle to heal 1d3 hp. Move silently (DEX) - automatically succeed at moving quietly, roll to move silently. Weapon specialist - +1 to hit with specialised weapon. Heavy armour specialist - 25% less encumbrance from metal armour. Slayer - +1 to hit & damage against special enemy. Tech lore (INT) - one turn per attempt to identify tech items. +2% to use artefacts. Arcane lore (INT) - one turn per attempt to identify magical effects or creatures. +1 bonus to learning rituals. Awareness - +1 bonus to searching. Only surprised on a 1. Poisons (INT) - use poisons safely, one turn per attempt to identify substances. Backstab - +4 to hit, double damage. It's probably clear that that list of talents contains a large proportion of the class abilities from traditional D&D, and even some from AD&D. Obviously the cleric's abilities aren't in the list, but that class doesn't fit at all in the setting, so things like turning undead were deliberately left out. It's a nice, quick, simple system, but I think it should provide enough choices and variety to make characters interesting. 5e -- why should I care? Why should I be interested in a new "version" of D&D? I have the Labyrinth Lord books which I use to run my games. I also have loads of AD&D books. I also have all the important AD&D 2e books, for that matter. If I really need it, the important bits of 3e (the SRD) are freely available online. I also have free downloads of any number of other rule sets (S&W, OSRIC, LOTFP, etc) available. Basically I have far more rule books than I will ever need, and the ability to house rule stuff together to cover bits I don't like or feel like modifying. So why should I be interested in a new "version" of D&D? I guess they're just relying on gamer ADD, the search for something new and perhaps "better". Maybe there is a good reason why I should care about 5e, that I've not thought of yet. But for now, I'll stick with the plentiful gaming material I've already got... no reason to change. As to what I would be interested in seeing WotC produce, well, personally nothing. I just don't tend to buy gaming materials apart from the rulebooks I use to run games. But I know lots of people like to buy campaign settings and adventures. To be honest it surprises me that they think what people really want is another set of rules! Strange. Continuing my planned house rules for creating characters in Carcosa, up next is attributes and mutations. Attributes will simply be rolled 3d6 in order. Quick, traditional and fraught. However, as a slight twist, every attribute rolled which is below average (i.e. 8 or lower) grants the character a beneficial mutation from the lists in Mutants & Mazes. Scores of 7 or 8 grant a class 1 mutation, 5s or 6s grant a class 2 mutation, and 3s or 4s grant a class 3 mutation. Where applicable (class 2 & 3) there's a 50% chance of the mutation being physical, and a 50% chance of it being mental. For ease of reference I've compiled mutation tables which include the experience level at which each mutation becomes active. For mutations which first activate at 2nd level or higher, I think I'll create a list of pre-active variations, so that the mutation has some use before its main effect "goes live". For example energy retaining cell structure, which is fully active from 3rd level, would perhaps allow a 1st or 2nd level character to discharge a minor shock (1d6 damage) once per day. So, as I mentioned in my mini-review of the mighty Carcosa supplement, my thoughts turned immediately to using the book in play. As the book comes with no assumed rules set (it's broadly D&D, but could work with any edition really), this inevitably led to the question: which game system to use to run it? What came to mind is three things: Labyrinth Lord (for the D&D base), Mutant Future (to further emphasise the pulp sci-fi / post-apocalyptic elements in Carcosa) and Call of Cthulhu (for more rituals -- more on this another time). What I ended up deciding on is a mixture of all three! The base is Mutants & Mazes, the LL-MF integration described in an appendix of Mutant Future. I've come up with a very simple custom character generation system, which I'll post here in sections over the coming days. The first topic is race. The Carcosa book describes the 13 different races of Men who inhabit the planet, but doesn't mention how a PC's race should be determined, or any differences between the races apart from skin colour. So I thought a random table would be in order, including some little mechanical differences for each of the races. 27-28 Roll again Gain a mutation*. Additional rolls of 27-28 stack. 29-30 Roll again Gain a psionic power. Additional rolls of 29-30 stack. * For racially determined mutations I'll probably use the table in the appendix of Carcosa. Obviously, as I'm planning on using Mutant Future, the beneficial mutations therein will also come into play. ps. For players in my Labyrinth Lord campaign: don't worry, your PCs are not about to be mysteriously warped to Carcosa! Haha. I'll probably run it as a one shot / occasional sessions, just for fun. Having received the new LOTFP edition of Carcosa in December, I sat down last night to have a first proper read of it (I'd just flicked through it previously). And, wow! I was really impressed. To give this mini-review a happy ending, as I'm indeed very very happy with Carcosa, I'm going to describe a few minor gripes I have with the book, before going into the things I love about it. Firstly, I do question the unusual choice of Armour Class system -- ascending from 12 -- as this system isn't used in any traditional or modern version of the game, meaning that the vast majority people who use this book will have to come up with some kind of conversion table or formula. I presume the base 12 ascending system is used in James Raggi's LOTFP RPG, but I think AC either descending or ascending from 10 would have been a better choice in this respect, as those are far more familiar and more easily usable to most people. But that's a very minor quibble. Secondly, I got the feeling that the book is written with a certain amount of knowledge of the source material (especially the writings of H.P. Lovecraft) pre-assumed. I've personally only read a smattering of Lovecraft, and found myself a little confused by the unexplained references to things like Old Ones, the Great Race, Primordial Ones, etc, and the relation all these beings have to Carcosa. A very small introductory passage, describing what these Mythos races have been up to on Carcosa (similar to the section describing the races of Men on Carcosa), would have been much appreciated. As it is, the book launches straight into a section on "Technological Artifacts of the Great Race", before any mention has been made as to who or what the Great Race are. Lastly, despite the physical beauty of the book, I wonder how practical the A5 format is for use at the gaming table. It's not possible to lay it flat open at a page, for example, which is possible with traditional full-size RPG books. So, those minor issues aside, here's why I love it! Firstly, purely as a physical artefact, the book is beautiful. It's definitely the best looking gaming book I own. The artwork, layout and quality of construction are all top notch. Clearly a lot of effort has gone into these things, and it has really paid off. Secondly, as an RPG sourcebook, it did what good examples of such books should do -- made me want to play! Reading through it, the mind is filled with so much amazing imagery, and presented with so many interesting situations, monsters, encounters and treasures, that one cannot help but immediately think about how awesome it would be to use this stuff in play. Aside from the vividly described details of the setting, one thing which really struck me as well was how usable and flexible the content is. It is fairly light on mechanics, meaning that it'd be easy to use with any version of D&D (or clones), and a good number of other RPGs as well, no doubt. Completely unexpectedly, I was eager to use Carcosa not only with Labyrinth Lord (my D&D flavour of choice), but also with Mutant Future, and even Call of Cthulhu! In fact, I pretty much concluded that I'd use an unholy hybrid of the three to run games in Carcosa (more on this another time). As to the controversial ritual sorcery, it is very horrid. To be honest I can't really imagine running a game where the PCs were the ones doing this kind of thing. But from the point of view of flavour it really adds a lot to the setting, and even if the PCs only come across others performing these rituals, or encounter them in old tomes or libraries, the presence of such magic would weigh heavily on the mood. In conclusion, this is a first class RPG supplement, and may perhaps gain the honour of being the first pre-written setting that I will actually make any use of! 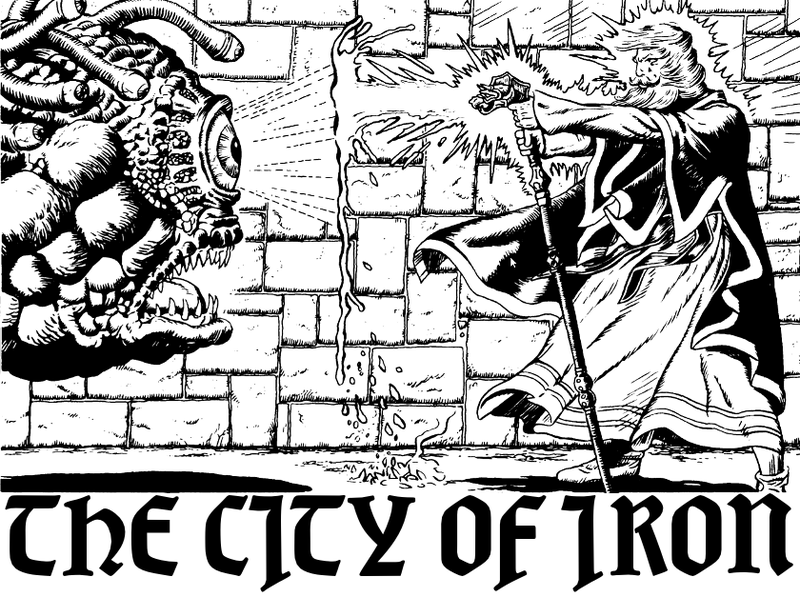 2011 was the year I properly launched myself into the OSR. On Jan 16th I DMed my first game of Labyrinth Lord, and that, as they say, was that -- I've not looked back since. As some others in the blogosphere have been doing, I thought I'd kick off 2012 with a look back at what I got up to in the previous year. Just looking through the posts I made last year, I've picked out one or two each month, which for me are defining moments. In January, I played old-school D&D for the first time in many years, and put the finishing touches on my Tome of the Spider Mage. In February, I published a PDF of my Elementalist class for Labyrinth Lord, and wrote about psychoactive substances for adventurers. In March, I wrote some nice illusionist spells dealing with prisms. In April, I participated in the A-Z challenge, which ended up in the publication of a PDF with a load of new spells: An Arcane Alphabet. In May, I decided to run my first game at a con, and wrote an amusing little historical piece about orcs in my campaign world. In June, I decided to write a book! In July, I won something. In August, I published a PDF of my Necromancer class for Labyrinth Lord. In September, I didn't do that much, but I did name the book. In October, I had an idea for an online collection of old-school monsters, which Alex Schröder kindly realised during the night, while I slept! It unfortunately hasn't gotten the attention it deserves, so go and check it out right now! In November, I finished the draft version of my book, and had some amusing conversation about what happens to playerless PCs in a dungeon. In December, I didn't do much, but I did draw a funny picture. All in all 2011 was a great year for my old-school gaming activities! Looking forward to more this year -- including, of course, the completion and publication of Theorems & Thaumaturgy!